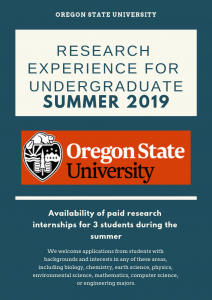 Oregon State University is proud to announce the availability of paid research internships for 3 students during the summer. The students will be located at the Hatfield Marine Science Center (HMSC) on the Pacific coast in Newport and another 10-12 located at the College of Earth, Ocean, and Atmospheric Sciences (CEOAS) in Corvallis.Funded by the National Science Foundation, the Research Experience for Undergraduates (REU) program offers students the unique opportunity to work on individual research projects, and participate in group field trips, seminars and science colloquia over a 10-week period at CEOAS and HMSC under the guidance of university and research agency scientists, who serve as mentors. If you want to apply what you’ve learned in the classroom to real-world problems, then a research experience in marine, estuarine, earth and atmospheric sciences may be right for you! We welcome applications from students with backgrounds and interests in any of these areas, including biology, chemistry, earth science, physics, environmental science, mathematics, computer science, or engineering majors.While students work independently with their research mentors, there are numerous opportunities to interact with other scientists and students at the Hatfield Marine Science Center in Newport and in CEOAS and other departments on the Corvallis campus, through orientation, weekly seminars, group field trips, social events, and final project presentations. Lists of potential mentors and project research areas appears below. Eligibility: Currently enrolled undergraduates who are not graduating seniors may apply. Eligibility limited to U.S. citizens and permanent residents. Students from underrepresented groups, community colleges and institutions with limited research opportunities are especially encouraged to apply. The project focuses on understanding the mechanisms of dune erosion under a storm profile mimicked from storms hitting the east coast of the U.S. during winter storms and hurricanes. There will be three dune types: a bare dune, a vegetated dune, and a man-made compacted dune. The experiments will be performed in the Oregon State University (OSU) O.H. Hinsdale Large Wave Flume (110 m long, 3.7 m wide, 4.6 m deep), a nationally supported facility, between May and Sept. of 2019. The project will be carried out in a large-scale laboratory in collaboration between University of Delaware, OSU, and Texas A&M. The REU students will spend a significant amount of their time helping to set up the dune configurations and instrumentation as well as collecting data. The REU student will be tasked with compiling the morpho dynamic change of the aerial (above water) dune system over time for each of the three dune architypes. The student will be responsible for processing and synthesizing data from a LIDAR system that will be used to measure the topographic change of the dune system above water over time. Data analysis will be ongoing as the experiments evolve in time and there will be opportunities for the student to stich their topographic change map together with the sub-aqueous (below water) maps to tell a story of how the full dune system evolves during the progression of the storm forcing conditions. By the end of the summer the student will 1) Gain an understanding for the wave processes that erode sand dunes, and learn (with us) the differences in erosion processes between bare, vegetated, and compacted dune systems. 2) Gain proficiency in loading, processing, and analyzing data in the computational package Matlab or Python. 3) Gain proficiency in communicating with other students and researchers on a day to day basis and will present their work to a broader audience. The REU student will be included within this larger cohort of undergraduate researchers, 20-25 students all focused on water and resiliency. During the course of the summer the REU students will go on a field trip to the Oregon coast that is a 45 minute drive from Corvallis and introduce them to some of the immediate coastal challenges that Oregon is faced with. Additionally, there will be group BBQ’s and lunch workshops that are focused on student research development. The objective of the research project is to develop a tool that could be used by local authorities to identify strategies that improve community resiliency before a natural disaster. The methodology will include adapting the best resiliency model for two different geographical areas susceptible to natural disasters. The first geographical area will be Puerto Rico which is exposed to earthquakes, tsunamis, and hurricanes. The second geographical area will be the Pacific North West region to be studied for earthquakes and tsunamis. The student will work on the first section of the project identifying multiple models from literature, selecting the most suitable model or combination of models, and adapting that model to be used in Puerto Rico. 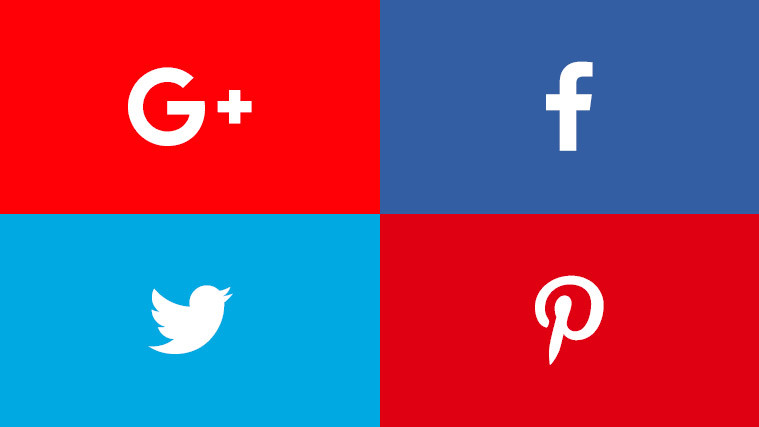 This will require to collect information on Puerto Rico’s distinctive local characteristics. Information on the events after hurricane Maria could provide unique perspective of the community resiliency needs after a disaster. 1. Have a better understanding of resiliency models and characteristics of the geographical areas used to develop this models. 2. Develop a research plan that can be systematically applied to answer research questions. 3. Communicate and collaborate with faculty and students at OSU to complete research tasks. 4. Develop and deliver a technical presentation with the findings of the research. The REU student will be included within this larger cohort of undergraduate researchers, ~20-25 students all focused on resiliency. 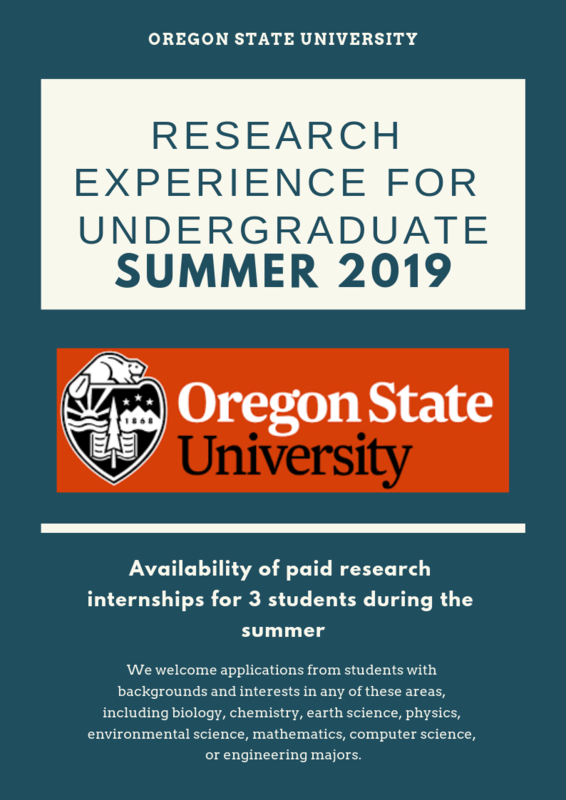 During the course of the summer the REU students will work directly with OSU faculty and graduate students. There will be other group activities such as lunch workshops that will help the student to develop their research skills.